‘I’ve got more awards from movies than I have for bodybuilding, weightlifting and powerlifting,’ he says. When Arnold Schwarzenegger arrived at the Joburg home of his idol Reg Park, the Austrian teenager was not only facing a turning point in his bodybuilding career, but his maiden visit to South Africa proved to be the catalyst that triggered a string of successes which would make him one of the world’s most popular personalities. Eager to emulate Park, a British bodybuilder and TV star who had settled in SA, Schwarzenegger spent a week with his childhood hero in the late-1960s, soaking in everything he could while gaining crucial insight into training and diet. Taking away all he had learned, Schwarzenegger arrived in the United States in 1968, settling in his adoptive nation where he would ultimately find both fame and fortune. “When I went to America, I laid bricks and worked with cement in order to make some money so I could afford the food and supplements that bodybuilders need to stay in shape,” he recalls, addressing a large crowd during a seminar at the Arnold Classic Africa in Sandton. Overcoming numerous difficulties, Schwarzenegger managed to establish his place as the best bodybuilder of his generation. It was not until his return to South Africa, however, for the 1975 Mr Olympia – when he won the sixth of his seven titles on a stage shared by black competitors after international organisers demanded the competition be unaffected by apartheid rule – that his career really took off. In the build-up to the Mr Olympia event, Schwarzenegger was part of the popular Pumping Iron documentary which launched his acting career. Going on to portray a protagonist in a number of hit science-fiction films including Predator, Total Recall and the hugely popular Terminator franchise, it was this facet of his life for which he would become best known. At the age of 69, he is still among the world’s most sought after action stars, and he will reprise his role in the Expendables franchise when the fourth film is released next year. “I’ve got more awards from movies than I have for bodybuilding, weightlifting and powerlifting,” he says, indicating just how successful he has become as a Hollywood star. Expanding on his existing profile as an accomplished athlete and actor, Schwarzenegger added another dimension to his well-rounded life when he entered the US state elections as a Republican candidate in 2003 and was elected governor of California, serving in the position until 2011. Notably, having earned millions of dollars as an actor, he turned down his entire $175 000 annual salary throughout his political tenure. Although he became a naturalised American citizen in September 1983, the US constitution prevents him from running for president, and while he has reportedly voiced his wish to have the rule overturned, Schwarzenegger insists he is not losing sleep over it. “Everything I’ve accomplished in my life is because of America, so I’m not going to complain about the only thing I can’t do,” he says. The Austrian-born giant has settled comfortably into his latest role as philanthropist, utilising his global status to promote health and fitness, and environmental awareness. He used his political power as governor of California to fight global warming, and in 2010 he founded the Regions 20 organisation which aims to assist in building a green economy. 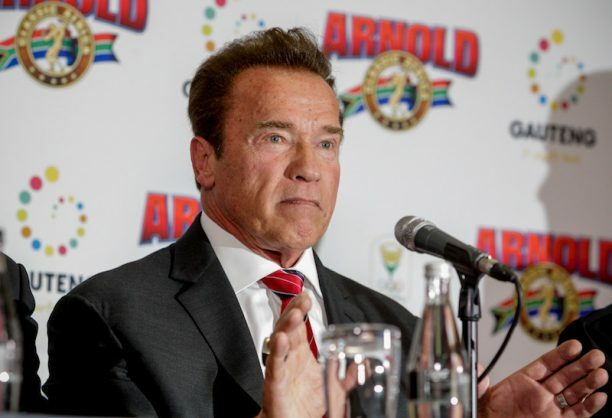 The Arnold Sports Festival he launched in 1989 has since spread to six continents, developing into the largest multi-sport series of its kind around the world, and his latest trip to SA coincided with the second edition of the African leg in Sandton. After expressing how much he enjoys touring this country, the crowd reacts with delight when he uses one of his trademark catchphrases from the Terminator films to promise that this will not be his last visit. Schwarzenegger leans forward, his bulky shoulders casting a wide shadow across the stage as his warm smile is replaced by a robotic glare. Playing to the crowd, he roars three simple words: “I’ll be back!” And the thunderous response from the floor assures him that he will always be welcome.